The 1889-CC Morgan Silver Dollar is a Rare Date in the Morgan Silver Dollar Series. In 1870, the Carson City Mint opened its doors for business, but by 1885, the facility was shut down. Some historians believe the stoppage occurred because of justifiable economic concerns, while others are convinced partisan politics played a hand in the decision. Things changed in July 1889 when the mint building was reopened. The first several months were spent preparing the facility for manufacturing operations. By October, the coining presses were once again stamping out the “CC” mintmark. Before the end of the year, a total of 350,000 of the 1889-CC Morgan Silver Dollar were produced. 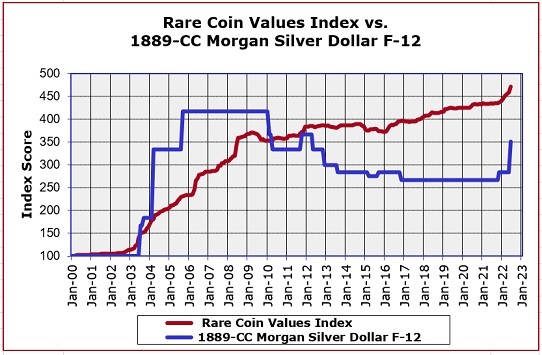 Numismatic scholars have concluded that perhaps 250,000 to 325,000 of the 1889-CC dollars were melted, making this date one of the scarcest in the entire Morgan Silver Dollar series. The 1889-CC Morgan Silver Dollar has a couple of angles that make it a collector’s favorite. First, it is a rare key date in what is absolutely one of the most popular type coins in American numismatics, the Morgan Dollar. Second, all coins of the Carson City Mint are associated with the “Wild West” aura, and carry added weight with collectors. A quick check of long term upwardly price trends for the 1889-CC attests to its stellar reputation. There are many key dates of great interest to collectors in the Morgan Dollar series, and the 1889-CC is certainly one of them. Price increases for the 1889-CC have been strong over the years, as the blue line in the chart above illustrates. Using the Year 2000 as a baseline, the 1889-CC multiplied in value by more than four times, before settling down in 2010. Contrast this to the red line graph of the Rare Coin Values Index, which is the composite percent change over the same time period of a cross-sectional group of 87 rare US coins. The goal of the Index is to approximate the direction and strength of the overall rare US coin market, and is updated every month.